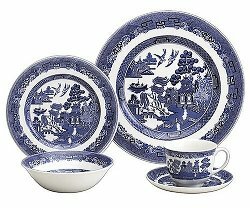 Blue Willow china is adorned with an intricate pattern of blue that appears on a white background. Most of the Blue Willow dishes are made of porcelain, but from time to time ceramic dishes with Blue Willow design can be found. The elaborate pattern was very popular in the eighteenth century, and production of it has continued for over two hundred years. In fact, versions of the Blue Willow dinnerware are produced by several manufacturers today. By all means, this pattern is definitely collectible. The pattern appears to be oriental at first glance. 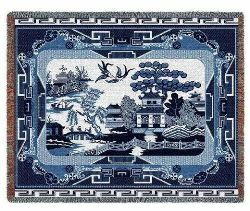 The design was inspired by dishes imported from China that were somewhat similar to the design we enjoy today; however, the ever prevalent Blue Willow design was originally developed in England. I really like the Johnson Brothers Willow Blue pattern. 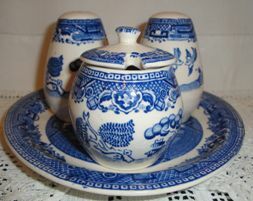 The Johnson Brothers Willow Blue Creamer, Covered Sugar Bowl, and Blue Willow Tea Set are quite original. I would love to have a set. Other producers of blue willow dinnerware include Adams, Addterly, Alfred Meakin, Allerton, Barratt, Booths, Buslem, Coalport, Cuthbertson, Maddox and Sons, McCoy, Myott, Norcrest, Ridgeway, Royal China, Royal Wessex, Staffordshire, and Wood and Sons. I am quite certain that there are more, but this is good start to finding the dinnerware that you desire. I actually have a Blue Willow dinnerware set. My youngest son likes the pattern, so I have it put up to give to him someday. I think that he likes it because of the oriental design. He collects things that are of Chinese or Japanese designs and I think that one day he will appreciate it. 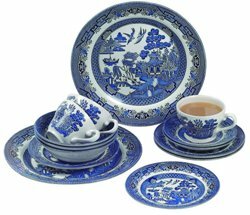 Right now, he's more into swords, dragons and ninja stuff… and Chinese food, so this Blue Willow china collection is being saved specifically for him.